SA to appeal relay exit? London - "Blade Runner" Oscar Pistorius's historic Olympic campaign ended on Thursday as the South African team failed to complete their 4x400m relay heat after a dramatic fall. Team-mate Ofentse Mogwane crashed heavily on the final bend of the second leg as Pistorius, the first double amputee to compete in Olympic athletics, waited to take the baton. Mogwane had moved up to fifth on the leg, but rounding the bend into the final stretch, he made contact with Kenyan Vincent Kiilu and both came to grief. "Somebody spiked me," said Kiilu, who unlike Mogwane was able to get up and continue. Pistorius put his hands to his head, walked to the side of the track and sank to his knees, staring down the straight. Mogwane received medical attention and left clutching his shoulder. "It's very disappointing, especially coming off second place in the world championships last year," said Pistorius, who runs on specially constructed carbon fibre blades. "We're pretty gutted. We've been training as a group for the last five or six years." Pistorius, who was followed here by his 89 year-old grandmother, who cared for him and his brother and sister after their mother died 10 years ago, said he hadn't seen what had taken place. "I took my eyes off the screen when he rounded the bend so I didn't see what happened. 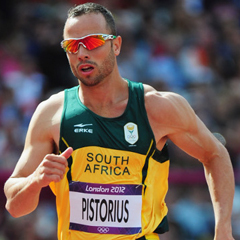 I was just waiting for the baton," said Pistorius, who will return here for the Paralympics later this month. "I don't know if he got spiked or caught up. He's a phenomenal athlete. "I feel sorry for my team-mates. Things do happen in relays." He admitted, however, that it was tough to see his adventure end in such an anti-climactic manner. "It's so hard, especially with the crowd being so amazing and there being so much support back home," he said. Pistorius, 25, who had only learned on the eve of the relay he would be running in his preferred third leg spot, made history last Saturday when he made his Olympics debut in the individual 400m. The South African, who had both his legs amputated below the knee before he was one, because of a congenital condition, had fought a long battle to be allowed to compete. Pistorius competed in the Athens 2004 and Beijing 2008 Paralympics. He was given the green light for the Olympics following studies that found his prosthetics give him no advantage over his able-bodied rivals.